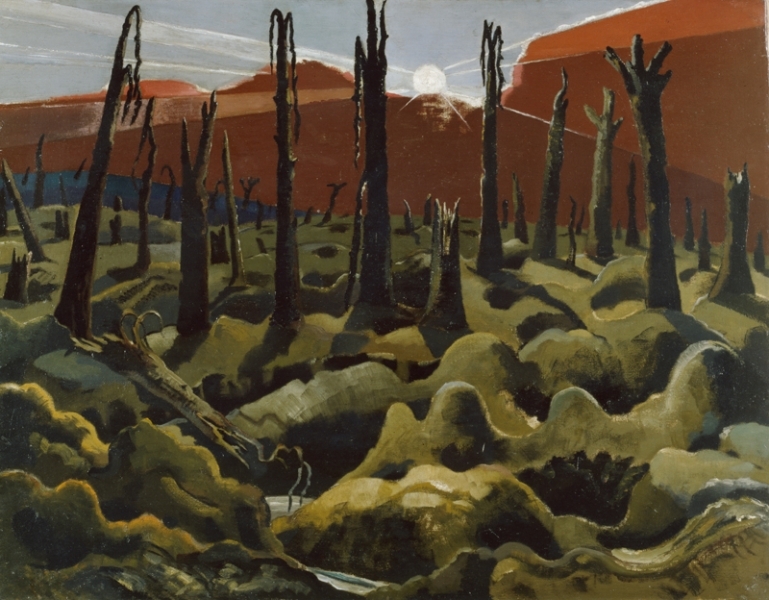 The fighting in the Ypres Salient in 1917 and the aftermath of the Battle of Passchendaele had a major effect on Paul Nash, and also made a big impact on his art. We are Making a New World is one of his most powerful paintings of the war, showing the sun rising on a scene of devastation. Red clouds symbolise the blood-letting, and the blasted trees stand for the dead soldiers. In addition, the semi-regular pattern of hillocks of mud carries a suggestion of graves. This picture was the centrepiece of Nash’s exhibition Void of War in 1918. Nash’s symbolic use of landscape (rather than showing dead soldiers) was admired at the time as a means of showing the ‘truth’ of war. We are Making a New World and other First World War paintings by Nash can be seen in the Laing’s new exhibition, Paul Nash, touring from Tate. It is unspeakable, godless, hopeless. I am no longer an artist interested and curious. I am a messenger who will bring back word from men fighting to those who want the war to last forever. Feeble, inarticulate will be my message, but it will have a bitter truth and may it burn their lousy souls. The Ypres Salient includes Hill 60, which Nash depicted in this watercolour. Hill 60 gave artillery observers a good view over the flat land around Ypres, and it was fought over throughout the war. Nash’s picture shows a huge mine crater on the hill, with shellfire sending up a mass of waterspouts. The criss-cross patterns Nash has scratched in the paint perhaps represent scattered sheets of expanded wire from destroyed trenches, or paths up the steep sides of the cratered earth. 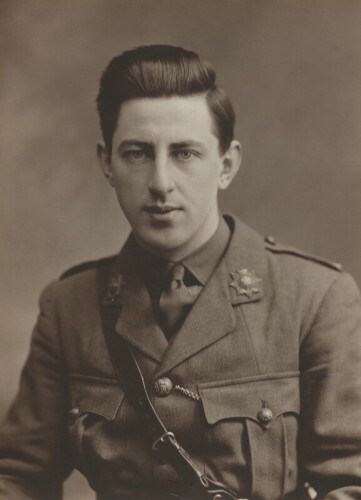 Nash narrowly avoided being involved in an attack on Hill 60 that killed many fellow soldiers in his regiment. That particular attack, in August 1917, took place while Nash was away in England recovering from injuries from falling into a trench. 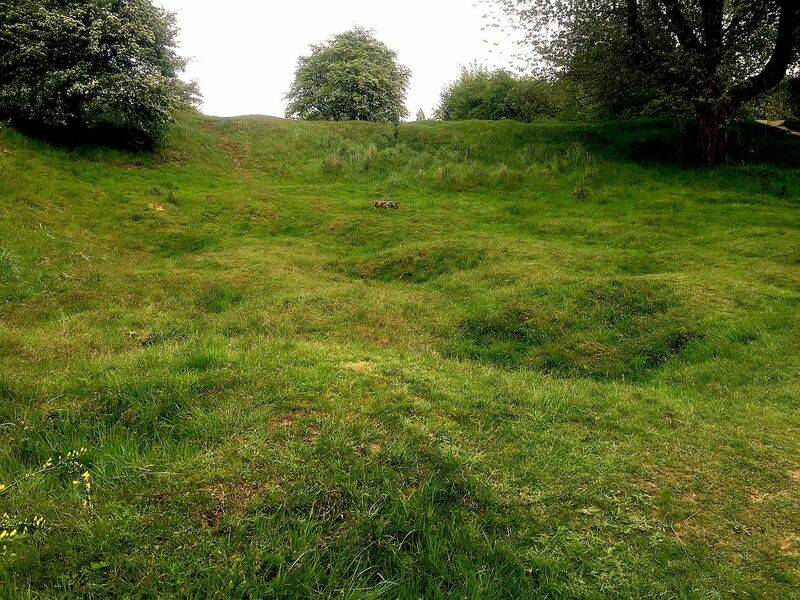 Many mines were used in the constant struggles to take Hill 60, and the land remains heavily cratered. The remains of many British, Australian and German soldiers still lie in the ground (just as there are soldiers’ remains all over the Western Front), and there are several memorials in the Battlefield Park. This photograph from inside a large mine crater from 1917 on Hill 60 is from this battlefield tour site, and there are also details of Hill 60 here. 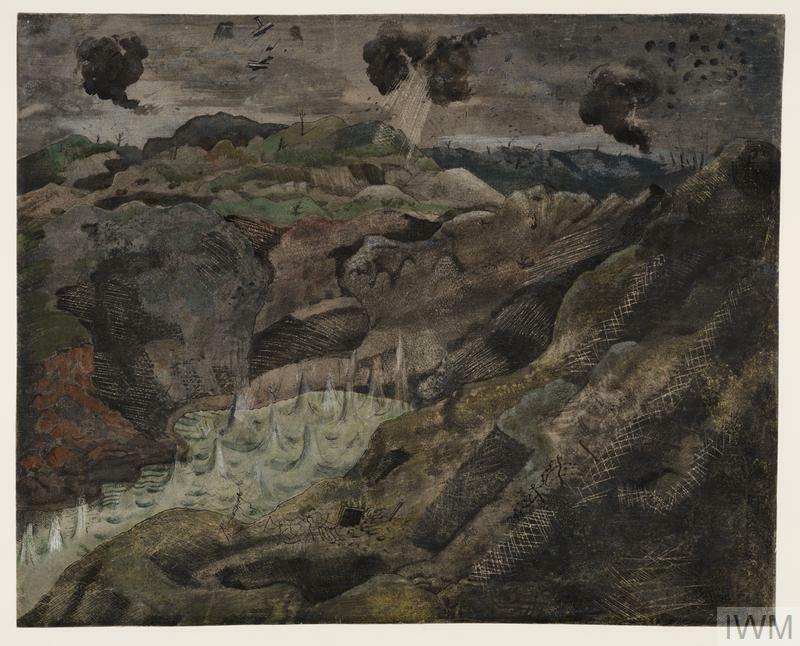 Nash’s horror at the slaughter of the war prompted him to paint a rare watercolour showing dead soldiers in the ruined landscape, which is also in the exhibition. The Battle of Passchendaele (July to November 1917) was still raging when Nash returned to the Ypres Salient at the end of October 1917, this time as an official war artist. 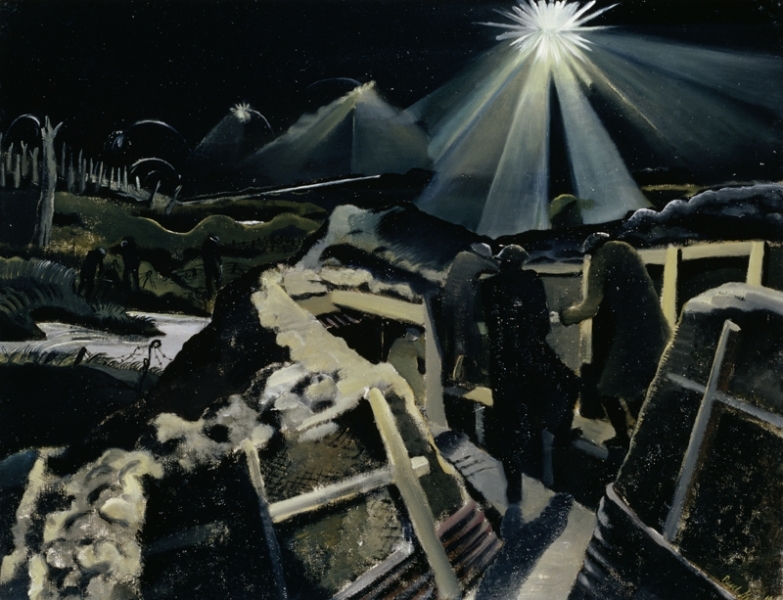 In his picture The Ypres Salient at Night, Nash conveys the disorientating effects of night combat as a star shell bursts over the zig-zag front line, causing the sentries to duck their heads to protect their night vision. Here, the ‘trench’ is raised, not dug in, because of surface water in this low-lying area. The earth walls are supported by frameworks of timber and expanded wire, with a base of curved corrugated iron. The Ypres Salient at Night was also included in Nash’s Void of War exhibition in 1918. The powerful pictures in the exhibition brought Nash a commission from the Government to produce a large painting as a memorial to the soldiers who fought and died in the war. 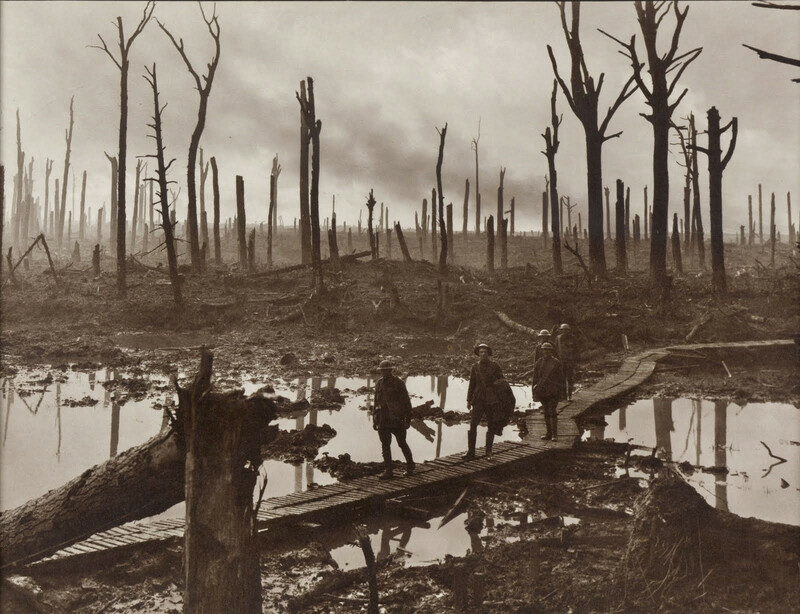 This is The Menin Road, 1918-19. Nash chose to paint one of the most dangerous spots on the Western Front, located on the main route from the city of Menin to the city of Ypres. Its dangers meant that it was almost deserted in daylight. In this huge painting, Nash used a fractured style influenced by Cubism and Vorticism to express the devastation of the landscape. Searchlights slash the sky, and the scene is fragmented by diagonal black shadows. Sharp-edged sheets of corrugated iron and angular concrete blocks from a destroyed trench or military post litter the earth. In the distance, columns of mud shoot up as shells explode. The only figures are a couple of soldiers in the centre of the composition, and another pair following on much further back, all of them almost lost in the huge panorama of desolation. Solid-looking dark clouds, infused with dust and smoke, add to the sense of menace. Comparing Nash’s painting with a well-known photograph of a similar scene from October 1917, we can see the way Nash has organised and patterned the landscape to create the effect he wanted. It’s also clear how he relied on the landscape itself, rather than figures, to represent the effects of war. 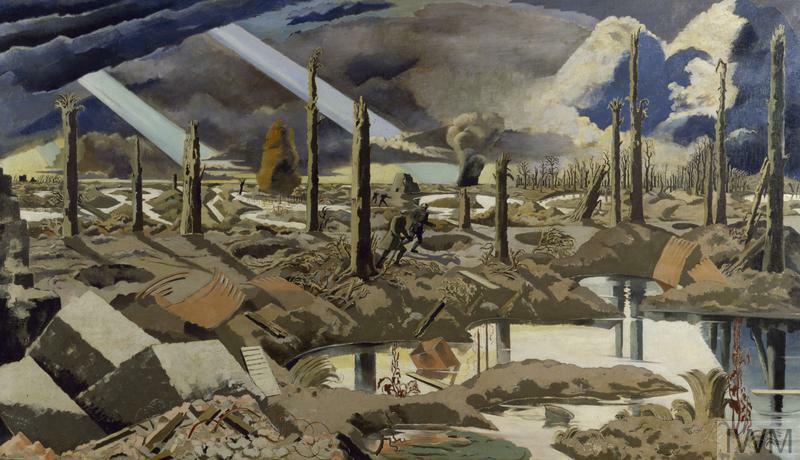 Even after Paul Nash returned home in 1918, the war was not completely over for him. Like many of the soldiers returning from the war, he suffered post-traumatic stress and depression. Echoes of the battlefront trenches and fortifications carried over into landscape paintings and coastal views he painted on the south coast of England in the 1920s. Paul Nash is on show at the Laing Art Gallery from 9 September to 14 January. very impressed by content, especially post war surrealist work put into context. hope you find this constructive!! !